The Gibraltar Gambling Act 2005 (the Gambling Act) is the principal legislative instrument regulating gambling activity in Gibraltar. The statute not only makes provision for the licensing and regulation of land-based gambling, but also gambling services through remote means (such as the telephone and internet). This legislation is partly modelled on the UK Gambling Act 2005.
c promoting or entering a lottery. c whether anything is or is not true. However, this does not include any bet made or stake hazarded in the course of, or incidental to, any gaming, and the expressions bet, betting and bookmaking shall be construed accordingly. d a game where a computer generates images or data taken to represent the actions of another participant or participants in the game. …any scheme for the distribution of prizes by chance or lot in which the participants or a substantial number of them make a contribution for the purposes of participation in the chances of the lottery and includes tombola, but does not include any gaming. With regard to free prize draws, the proposed offering will need to be considered carefully to determine whether it is licensable or not. In gaming it is possible that a player playing a game for a prize does not necessarily (unlike in lotteries) make a bet or stake on the game. This analysis becomes important when looking at social gaming or free play games that might still be regarded as requiring a licence. Such offerings would definitely not require a licence if there is no prize. Gibraltar’s first gambling statute was enacted in the 1950s and covered the provision of land-based gambling services. The legislation did not envisage the provision of gambling services through remote means. However, in the 1990s, Gibraltar saw the first remote providers of gambling in the jurisdiction, most notably Victor Chandler and Ladbrokes, which commenced their telephone betting operations from here. The jurisdiction’s reputation as a centre for remote operator business was consolidated in the early 2000s when the first internet gambling service providers were established in Gibraltar. These initial licence arrangements were extended under the terms of the old legislation, which did not provide for gambling through remote means. Therefore, specific and bespoke arrangements were granted pursuant to individual licence agreements on terms contractually agreed between the operators and the Gibraltar government as the Licensing Authority. The increasing numbers of internet gambling providers relocating and establishing their business in Gibraltar, and the commercial pressures of some of the larger businesses who wished to list their shares on the stock exchange, gave rise to the enactment of the current Gibraltar Gambling Act 2005. This legislation is significantly modelled on the UK Gambling Act 2005. The statute not only makes provision for the licensing and regulation of land-based gambling, but also gambling services through remote means (such as the telephone and internet). The Gibraltar government has therefore, for a number of decades, supported and encouraged the industry, in particular the remote gambling industry, in a regulated environment with reputation being of paramount importance to the jurisdiction. All types of gambling products can be commercially offered in Gibraltar with the exception of lotteries. In relation to the latter, the only lottery permitted under the Gambling Act is the Gibraltar Government Lottery and small bazaars, fetes and fairground-style lotteries (of the types identified in Schedule 2 of the Gambling Act). The Gibraltar Government Lottery is a small lottery not offered remotely, and is based on printed tickets. Gibraltar as a geographical jurisdiction is very small, and there is a common licensing and regulatory framework for the entire jurisdiction. There is no sub-delegation of authority to other municipalities as there are none, and the administration of these matters are handled by the relevant authority, being the Gibraltar Licensing Authority, for the jurisdiction as a whole. The government of Gibraltar has a permissive attitude in respect of the provision of gambling matters, and there is no general restriction in relation to foreign operators providing gambling products to citizens of the jurisdiction. However, this is in the context of remote gambling. Any foreign operator who wants to provide land-based gambling would need to apply and obtain the relevant licences locally. d in breach of copyright laws. However, it should be noted that copyright and intellectual property rights are specifically safeguarded by other legislative instruments. It should also be noted that these advertising rules are also applicable in respect of licensees in Gibraltar. It is difficult to prohibit advertising from foreign operators through the various media. Enforcement will necessarily have to go through the appropriate legal channels in the jurisdictions involved and, depending on the treaty arrangements between Gibraltar and those jurisdictions and the nature of the infringement, the process of enforcement will be different (either through police cooperation or court process). As highlighted in Section I.ii, supra, the principal legislation governing gambling activities in Gibraltar is the Gambling Act. The Gambling Act sets out a licensing and regulatory framework for both land-based gambling and remote gambling. The definitions of gambling and gaming are set out in Section I.i, supra. The different categories of gambling include betting (such as pool betting) and bookmaking, gaming and lottery. The ‘gaming’ element includes all types of casino games, poker, slots, machine gaming, bingo and all other number games without limitation. Competitions based purely on skill are not subject to any licensing or regulatory framework in Gibraltar, but the Gambling Act does cover games of chance that can be eliminated by superlative skill (the most obvious of these being poker). Financial spread-betting offerings are required to operate under a dual-licensing system pursuant to both the Gambling Act and the Financial Services (Markets in Financial Instruments) Act 2006. While primarily regarded as an offering that is regulated by the Financial Services Commission (the Gibraltar financial services regulator), the Gambling Commissioner acts as a secondary regulator. All licensing and regulatory matters are determined by the Licensing Authority. The Licensing Authority, pursuant to the Gambling Act, is the Minister for Gambling. All regulatory aspects (post-licensing) are within the remit of responsibility of the Gambling Commissioner and his or her regulatory team. Although the roles are distinct and separate, the personnel and infrastructure organisations of both departments are merged into one. This ensures a more streamlined approach whereby the licensing and regulatory teams work closely to complement each other. This results in a more efficient exercise of their duties, which benefits licence holders. Part VIII of the Gambling Act contains the enforcement provisions in relation to compliance by licence holders to the terms of their licences. Section 42 of the Gambling Act grants extensive powers of investigation, reporting and powers of entry where a licence holder is suspected of carrying on activity contrary to the provisions and terms of their licence, the Act or in a manner which is otherwise prejudicial to the public interest, the interest of any customer or potential customer or to the reputation of Gibraltar. This part of the Gambling Act also sets out the powers of the Licensing Authority to suspend or revoke a licence and enables a Justice of the Peace, if satisfied with the information laid before him or her, to grant the Gambling Commissioner or the police with a warrant to search premises. The Gambling Act provides for both land-based and remote gambling. While both are catered for in the legislation, the respective licensing regimes and requirements are different, as set out in Sections II.iv and II.v, infra. g pay all such charges, fees and gaming taxes as are prescribed by the Licensing Authority. The Gambling Act carefully prescribes the licensing regime applicable to land-based operators. a Bookmaker’s licence: this allows the holder to undertake, either on his or her own account or as agent, the business of receiving or negotiating bets. Furthermore, it should be noted that it shall be an offence for any person to keep or use any premises, or cause, or knowingly permit any premises to be used as a place where persons resorting thereto may effect any betting transactions without having previously obtained a bookmaker’s licence. b Pool promoter’s licence: this allows the holder to run pool betting operations. Strict restrictions are imposed on the use of premises for the provision of pool betting services where the owner of such premises does not hold a pool promoter’s licence. c Gaming operator’s licence: this allows the holder to conduct or provide gaming facilities (this includes the provision of games of chance for a prize, such as casino games). Restrictions are also imposed on the use of premises to conduct gaming operations. d Lottery promoter’s licence: this allows the holder to promote or operate lotteries. e Gaming machine licence: this allows the holder to keep on his or her premises gaming machines for the purpose of land-based gaming services. Land-based gambling in Gibraltar occurs primarily in casinos (of which there are currently two licensed). Certain bars and restaurants also have single, stand-alone machines under gaming machine licences. Non-remote gambling licensees must conduct their business from approved premises and must maintain their licence in accordance with the conditions upon which it is issued. The government conducts a lottery. The Gambling Act prohibits land-based lotteries operating in Gibraltar other than the Gibraltar Government Lottery and other small bazaars, fete and fairground style lotteries (of the types identified in Schedule 2 of the Gambling Act). No similar restrictions apply when conducting online lotteries from Gibraltar targeted at end users located outside Gibraltar. e any other electronic or other technology for facilitating communication. The Gambling Act establishes a licensing and regulatory framework for the provision of gambling services through remote means. However, the first ‘remote gambling’ licences issued in Gibraltar predate the enactment of the 2005 legislation. There are currently only 34 licensed remote gambling operators in the jurisdiction given that the government has applied a very restrictive and selective policy towards the licensing of operators in the jurisdiction by requiring a substantive presence resulting in real accountability to the regulator, constant monitoring of operations and ensuring that gambling services are provided responsibly with appropriate measures to protect the young and problem gamblers. Although there is no limit to the number of licences that may be issued in Gibraltar, given the current licensing policy, which requires a bricks-and-mortar operation with key equipment in the jurisdiction (including servers), the number of licensees is selectively kept low and the increase in licences will be steady and controlled. There should nonetheless be a steady rise of licensees in Gibraltar as opportunities develop for medium-sized businesses with niche markets and products that have not partnered with other complementary operations or otherwise merged. While the legislation envisages that anyone can apply, there are various criteria applied by the authorities in determining whether to license an operator. The principal criterion is that described above: real presence with senior individuals managing the business and with key technical equipment in the jurisdiction. The Gambling Act only envisages one type of remote gambling licence: the operator licence. There are, however, sub-categories of this licence depending on the nature of the services provided, which are ‘casino’ (including poker, bingo, slots), ‘betting’ and ‘lottery’. Notwithstanding the single type of licence, the Licensing Authority recognises the business-to-business (B2B) model and will extend a licence for such operations pursuant to the current Gambling Act and contractual arrangements agreed between the parties. There are numerous B2B operators in the jurisdiction who provide hardware, software and operational or platform support and solutions to business-to-consumer (B2C) gambling operators. We are seeing a very steady increase in the number of B2B providers applying for and obtaining Gibraltar licences who recognise opportunities for their business in the local market and in using Gibraltar as hub for provision to operators in other regulated jurisdictions. Most of the larger B2C operators also provide, as a significant element of their business, B2B services. The majority of these are white label services pursuant to which the operator provides the core gambling services, as well as customer services, registration and account handling, to a third party that owns a brand and websites. All white labels entered into by Gibraltar operators require prior Licensing Authority approval, which in most cases is a relatively straightforward procedure involving the submission of due diligence documentation on the white label partner. The government of Gibraltar announced a general review of the gambling licensing and regulatory framework, given that the principal legislation was passed in 2005 and the online gambling industry and third-party suppliers have developed significantly since. Although the proposed legislative changes are still, at the time of writing, a matter of consultation, we envisage that the reform will include the appropriate licensing of the different types of businesses in this sector, such as the B2B operator or supplier (hardware or software providers) and white label partners. Licensing application and processing will depend on the type of licence being sought (non-remote or remote). In general terms, the applicant will need to prove their reputation, provide a business plan and demonstrate their skills in the sector. The investment in the jurisdiction and local plans will be very relevant in the assessment to be made by the Licensing Authority. Given the territorial limits of the jurisdiction, there is little movement on land-based gambling operations. There are currently two licensed casinos locally and a number of betting shops. Most applications therefore arise in the context of remote gambling operators. Although there is no limit to the number of remote gambling licences that may be issued in Gibraltar, given the current licensing policy, which requires a bricks-and-mortar operation with key equipment in the jurisdiction, the numbers of licensees are selectively kept low and it is not anticipated that there will be a sharp increase in licences. k the proposed control measures and procedures to seek to identify money laundering and other suspicious transactions. The application for an online gambling licence is a two-stage process. It involves an initial approach to the Licensing Authority for an in-principle response on whether an application would be favourably considered before progressing to the second, formal application stage. Once an in-principle favourable approval is received, the formal licence application is prepared and submitted and includes, inter alia, an application form, business plan and due diligence of the group and its partners and core gaming suppliers. There is a £10,000 fee payable on application and a £2,000 annual renewal fee. Quite separately, there are gaming charges applicable (see Section V, infra). With regard to non-remote betting and betting offices and gaming and gaming establishments, the licensee must conduct its business from approved premises and must maintain its licence in accordance with the conditions upon which it is issued. In the case of remote gambling, the licensee must ensure it complies with the provisions of the Act, its licence terms and the Codes of Conduct issued by the Licensing Authority, in particular the Remote Technical and Operating Standards for the Gibraltar Gaming Industry. Quite apart from the specific obligations and conditions that a licence holder needs to comply with depending on whether it is offering remote or non-remote gambling services, each licence holder is obliged to follow the same rules (a–g) as provided in Section II.iii, supra. Part VIII of the Gambling Act contains all the enforcement provisions in relation to the compliance by licence holders to the terms of their licences. Section 42 of the Gambling Act grants extensive powers of investigation, reporting and powers of entry when a licence holder is suspected of carrying on activities contrary to the provisions of his or her licence, the Act or in a manner which is otherwise prejudicial to the public interest, the interest of any customer or potential customer or to the reputation of Gibraltar. This part of the Gambling Act also sets out the powers of the Licensing Authority to suspend or revoke a licence and enables a Justice of the Peace to grant the Gambling Commissioner and or the police with a warrant to search the premises. The Gambling Act imposes significant penalties on those persons providing remote gambling services without having previously sought and obtained the relevant approvals and licences (these penalties apply equally to B2B and B2C operators). On summary conviction, the penalty may include a fine of up to £5,000 or a maximum of three months in prison, or both. On conviction or indictment, there may be a fine or imprisonment for a term not exceeding one year, or both. See Section III.ii, supra, regarding enforcement provisions in Part VIII of the Gambling Act. The Act imposes significant penalties on those persons providing remote gambling services without having previously sought and obtained the relevant approvals and licences – see Section III.ii, supra. Gibraltar has enacted legislation to comply with the EU’s Third Money Laundering Directive (the Directive). The primary piece of legislation in this area is the Crime (Money Laundering and Proceeds) Act 2007 (CMLPA) together with the Crime (Money Laundering and Proceeds) Amendment Act of 2010. The Act also contains a number of sections relating to AML, and the Terrorist Asset-Freezing Regulations 2011 are also applicable in the jurisdiction. In particular, Section 33 of the Gambling Act 2005 stipulates that all remote and non-remote gambling licensees must comply with the provisions of the CMLPA. In addition, the licence conditions for remote gambling operators provide that remote gambling licensees need to ensure compliance with the Financial Service Commission (FSC) Guidance Notes on AML and related matters (in addition to the separate Codes of Practice issued by the Gambling Commissioner). Under Section 36 of the Act, which is applicable to all licence holders in Gibraltar, all licensees need to establish and maintain an effective system of internal controls and procedures in respect of any transactions that may give rise to a suspicion of money laundering. Gibraltar’s Financial Intelligence Unit (GFIU), which, together with the FSC ensures money laundering compliance and vigilance within the financial services industry, has recourse against relevant financial businesses, which includes casinos and other online operators. They require that systems and training are in place to prevent money laundering, including know-your-client procedures, record-keeping and internal reporting procedures. Under the CMLPA, the Licensing Authority is designated as the supervisory body for AML in the gambling industry. The Gambling Commissioner is empowered to issue guidance notes and to monitor the gambling industry’s compliance regarding anti-money laundering and terrorist financing. The Gambling Commissioner has also issued a comprehensive Anti-Money Laundering Code of Practice (the Code) for the gambling industry. 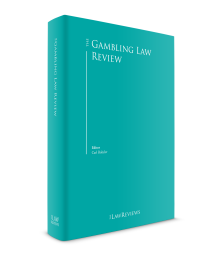 This is a detailed document that sets out the standards and thresholds required by the Gambling Commissioner from all Gibraltar remote gambling licensees. c additional considerations for both remote and non-remote gambling operators. Pursuant to the Gambling Act, a licence holder is required to give written notification to the Licensing Authority of all the facts known in relation to a suspicious transaction within 24 hours or as soon as is practical. The licence holder may take all reasonable and proportionate steps in closing or suspending the account of the suspicious registered participant. The Anti-Money Laundering Code of Practice provides a detailed procedure relating to making and submitting suspicious activity reports (SARs). Section 3.23 states that where the conduct or activities of a customer gives rise to the knowledge or suspicion that the customer is or is attempting money laundering, an internal suspicious activity report should be made by the relevant staff member to a nominated manager or officer at the earliest opportunity. These SARs will then be provided directly to the Licensing Authority and the GFIU (by hand). The Commissioner will also liaise directly with the GFIU on any technical aspects relating to the SAR. The taxation of companies and individuals in Gibraltar is governed by one piece of primary legislation, the Income Tax Act. This is supported by subsidiary legislation enabled by the provisions of the Income Tax Act. Previous legislation allowing for tax-exempt companies (providing a zero per cent rate) has been phased out with all exempt companies having expired in December 2010. The new corporate tax system was introduced on 1 January 2011 to provide a seamless transition for these companies into the new 10 per cent headline rate, though it may be possible to mitigate this significantly under the appropriate circumstances. In this regard, Gibraltar also transposed the EU Parent Subsidiary Directive under the Parent Subsidiary Company Rules 1991. Under these provisions, a parent company is not liable in certain circumstances to tax in respect of dividend income paid by a subsidiary to its parent. Likewise, a Gibraltar company making a dividend payment out would not have to withhold tax. Separately, gambling operators in Gibraltar are also subject to a gaming duty charge. This is levied at a rate of 1 per cent of turnover in respect of betting services and 1 per cent of gaming yield in relation to gaming services (casino and poker), but is subject to a minimum of £85,000 a year and a maximum of £425,000 a year. 1 Nyreen Llamas is a partner and Andrew Montegriffo is an associate at Hassans International Law Firm.